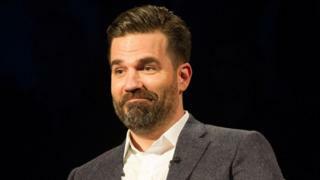 US actor and comedian Rob Delaney has announced he and his wife Leah are to become parents to their fourth child. The star of the Channel 4 sitcom Catastrophe, who lives in London, shared the news with fans on Twitter. It comes five months after the death of the couple's two-year-old son Henry, who was diagnosed with a brain tumour in 2016 and died in January. In a video, the actor praised the NHS and called for US citizens to campaign for better healthcare. Delaney, who has two further children with Leah, wrote on Twitter that two "typically wonderful" midwives had visited him and his wife to assess them for a home birth. Continuing his praise for the health service, he sent his "love" to protesters marching in London on Saturday to mark the NHS' 70th birthday. The tweet also included a video he made for Democratic Socialists for Medicare for All, talking about the differences between the healthcare systems in the US and the UK. In the video, Delaney said: "Our son Henry passed away in January of this year from cancer and he was a beautiful little boy from the moment he was born until the moment he died. "That financial stress, we didn't have to endure here, and what a gift." Delaney revealed his son's battle with the illness in February, saying Henry had been diagnosed with cancer shortly after his first birthday, following persistent vomiting and weight loss. The one-year-old had surgery to remove the tumour and continued with treatment in 2017, but later that year the cancer returned and he died in January, aged two. Then, Delaney thanked the health service, writing on Facebook: "The NHS nurses and doctors and the home carers and charity workers who helped our family survive Henry's illness will be my heroes until the day I die. "I am desperately sad right now, but I can say with authority that there is good in this world." He also called on the public not to take the NHS "for granted".